Renee isnt a snob after all!! But Still no Jim from the Office. 2 of my coworkers went back the movie trailers yesterday after work. I was off yesterday and asked at lunch if they were going and was told no, that the production guy said they were leaving and were done downtown. So I didnt come in, but 2 gals decided at the last minute to go and they hit the jackpot LOL. Renee came out of her trailer and was taking pictures of the crowd. She then went into the crowd and signed autographs and posed for pictures! They said she was very very nice. I dont think the crowd was huge, maybe 50 people or so. She laughed and chatted with people too....not at all the snob I thought at first. They said the only time she got a little snarky was with a paparazzi guy that came here from LA. She asked him to stop taking pictures after he got a few and (I think she knew him from before, he must be on the Renee beat LOL) she told him he has more pictures of her than her own family had! She did have a HUGE bodyguard and an assistant with her. 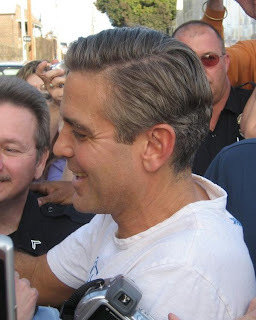 Then George came out of his trailer and signed autographs too, he didnt have an entourage, it was just him. My coworker got some of him on video. What a nice nice guy. He kept saying he had to get back to work, I think he had to check the scenes they shot that day or whatever a director does. Jim from the Office did not make an appearance, he may not have even been there if he wasnt needed that day. Anyway I posted my coworkers pictures, she sent them to me. The girl in the one pic with Renee is my coworker, and if you look in the background there is the other coworker, you can only see one eye and one lens of her glasses LOL. I was really jealous last night but today I had another almost medical crisis so I got over my jealously. I thought I had another blood clot in my leg, it was hurting in the same place as before and I was scared and a bit worried about calling wolf but I was really scared so I called the doc and I had an ultrasound which showed NO clot YEAH!!!! But I was worried. And I was in alot of pain today, the first thing I did when I got home was pop a pain pill and I never do that until bedtime usually so I can sleep. I hate calling wolf but I feel much better, I was really scared. I think maybe because my dad just died of that stroke recently that I am too paraniod these days. bad storms here right now, I am not sure if I will be able to post this. This is the same storm system that spawned a tornado that killed some high school kids in Alabama. Mrs Slushie and any other bloggers out there, be safe and warm tonight!! If anyone knows George or if you are George (haha) tell him there is a Gal that cant walk that would LOVE to meet him. LOL call me George...punch my digits. email me . I will take whatever I can get! LOL. Who cares about Jim? Where's Pam. WOW!!!!!! How cool is that? Those pictures are great! So cool that your co-worker emailed them to you. Glad to read that you don't have another blood clot. That's a bit scarey. I hope the pain goes away quickly! Never EVER worry about calling "wolf". I call it "taking care of yourself". Afterall, you are your priority, not the doctor. You feel you want it checked out, get it checked out! Great pictures by the way, and yeah...they do look friendly. I'm glad that there is no clot! Mel, take it easy and take care of yourself. The weather was horrible!! Finally it has past, thank goodness. And if you get to talk to George, just let him know I'm waiting... lol. Oh honey sorry about the leg I bet you were scared!! Glad it wasn't a clot. My knees are feeling good today and with every step I am saying thank you God! I live for days like today. Plus the the little weenie dogs are in the office and the lady I got Dooley from brought in the cutest puppy ever!!!! I think Lewis will buy it!George is so HOT and you know Renee is from Texas!!! I told the nurse at my office that I was afraid they would think I was a hypocondriac and she said, "Oh, no. You should see how often some people call." LOL. I bet your doctor would rather you call with your concerns. I understand how you feel though. Every little cough, and I still think, "Is it lung cancer?"